The Canada Goose Shelburne Parka Fusion Fit is the only one of the three that does not have an adjustable bungee cord at the inner waist so the shape of this one is much more boxy. The sleeves of this one are also a bit longer than the others, though still much better than the regular fit as shown here. I liked this one the least of the three since it looks most like the usual puffer coat. 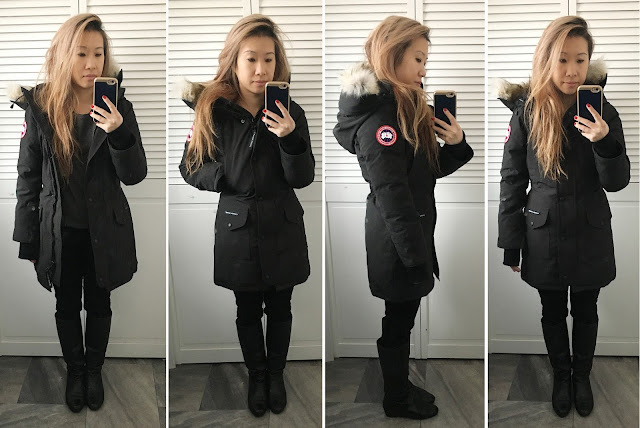 The Canada Goose Trillium Fusion Fit Parka is the one I liked the most of the three since there are breast pockets, which are handy for keeping hands warm (hah) and has a nice cinched back detail. It is also rated as being more warm than the Shelburne and Rossclair but I still felt cold in it when worn out in 30+ degree weather, so that was a disappointment, similar to how I felt about the Parajumpers one here. Since I didn't love any of the three, I will unfortunately be returning them all and am left empty-handed for a new winter coat. I still like the Beechwood the best for how I felt when wearing it and the Victoria the best for warmth as mentioned here and here. 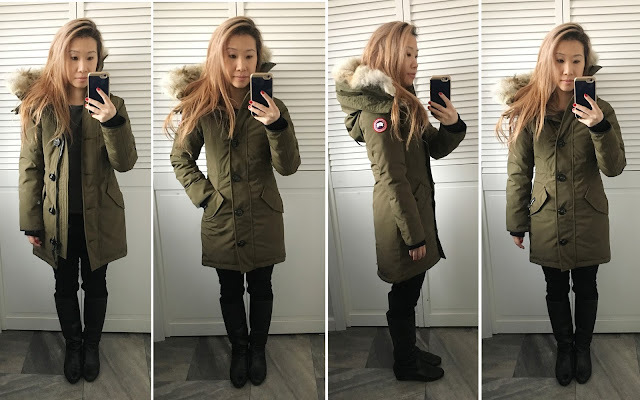 I will rely on layering for now until I find the perfect winter coat that is what I'm looking for both in style and warmth. Hi! Sure, my bust is 31", waist 26.5", and low hip 33". I do feel the Trillium felt and looked the must slim/snug. I hope this helps! Hi! Just wondering with your bust measurement, did the Rossclair feel thight on the chest area? The measurement guide said the bust for XXS goes to 30inch. Hi! My bust area did not feel too tight but it is snug, which I like. Hi! It's interesting you said the Victoria is the warmest one out of all the CG coats you tried on. I thought it would be the Trillium because it's a TEI 4 and the Victoria is a TEI 3. I can't decide between the two. I'm either a Trillium Fusion small or extra small and I wear a small in the Victoria. Which one did you feel comfortable in without feeling too snug and which one did you feel bulkier in? I'm so sorry I missed this! I was surprised I felt warmer in the Victoria too but it may be because it's more snug throughout and it could also have just been the day. I felt comfortable in both but the fusion fit was more snug so I would have gone with the Victoria in fusion fit if they had that since I like it slimmer and more snug. Sorry if this is too late! Your reviews and photos are SO helpful to me. I'm 5' and under 90# and the XXS Rossclair fusion fit I tried at Nordstrom's looked the same on me as in your photos. Now I know how the fusion fit Shelburne and Trillium will look on me without a try-on. I now feel confident bidding on ebay. 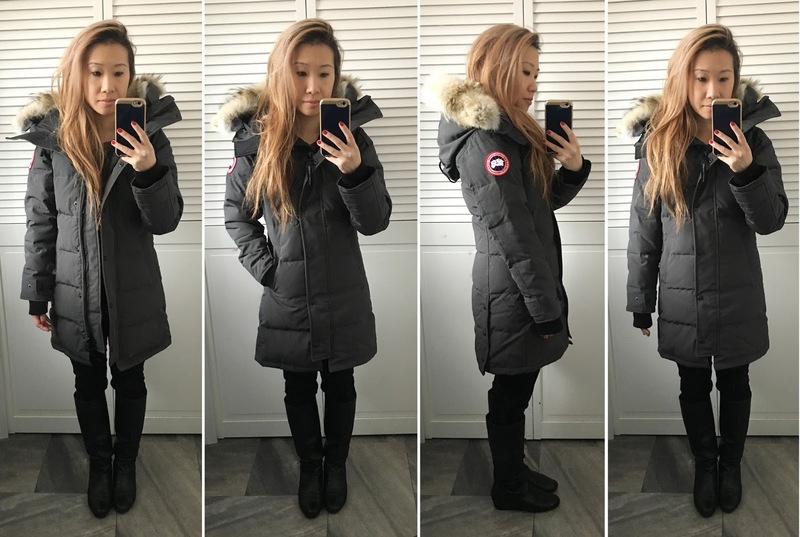 I want a fusion fit CG parka but don't think that any of them is worth the retail price. 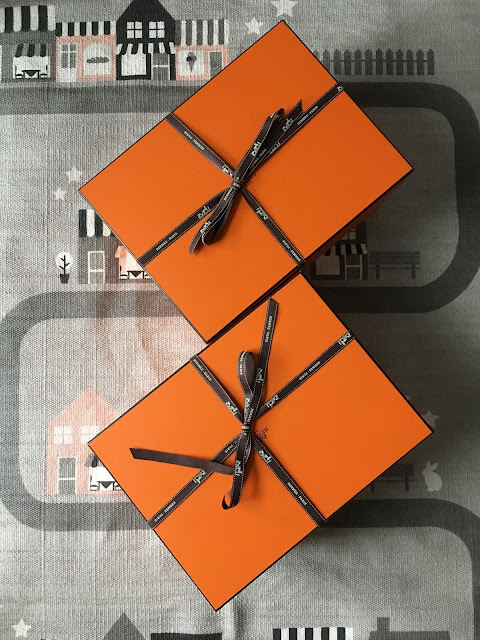 Thank you so much, Brietta. Nice way to stay warm. 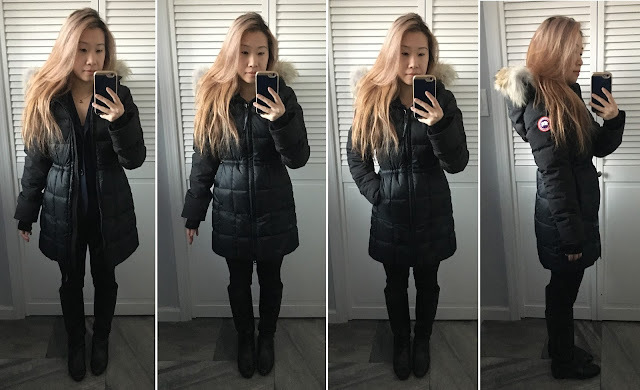 So helpful - trying to find my wife a coat and your photos and info are awesome! The most helpful CG review everr!! !